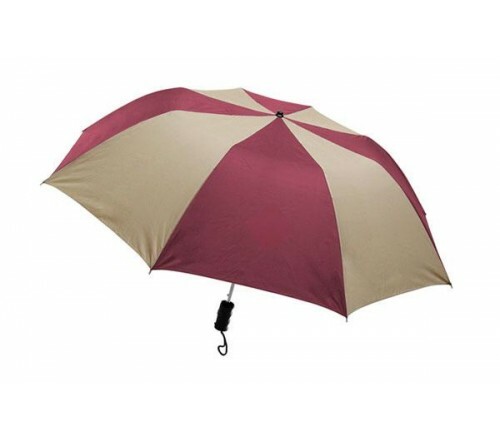 Personalized burgundy & khaki 44” arc barrister auto – open folding umbrellas are for those who wish to map adoration on faces of their customers while using this umbrella. People are always enamored with unique color combinations and they always try to preserve such objects for a lifetime, which means this umbrella will be retained for long time. 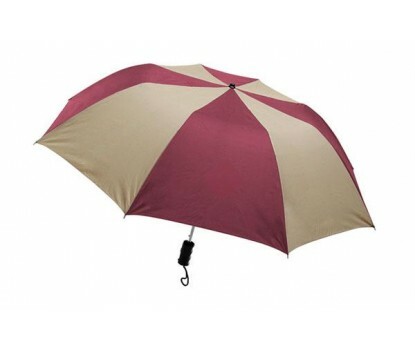 Features – auto – open function, sturdy metal shaft, large 44” arc burgundy and khaki canopy offered with plastic handle & carrying strap. Dimensions- 44", folds to 15". Imprint area – 9 ¼ “W X 6 ¼” H X 6” top. Available Colors : Black, Black/Gold, Black/Khaki, Black/White, Burgundy, Burgundy/Khaki, Burgundy/White, Forest/Khaki, Forest/White, Forest Green, Kelly/White, Kelly Green, Navy, Khaki, Navy/White, Navy/Gold,Navy/Khaki, Orange/White, Purple/White, Purple/Gold, Red, Red/Black, Red/White, Royal, Royal/Black, Royal/White, Teal/White, White and Yellow. Product & Design Quality - Excellent! Customer Service & Shipping - Product was just as I ordered and expected. Product & Design Quality - Quality product and custom design exceeded expectations. Will definitely order from this company again and refer anyone interested in customized merchandise. Customer Service & Shipping - Customer service very prompt and helpful - shipped w/i the indicated time window.